Mrs C. T. OTT (sister), Saint Andrews, Canterbury' Later Robert PULLENGER (brother), Hunterville. Height 5 feet 10 inches. Weight 151 lbs. Chest measurement 35-38 inches. Complexion fair. Eyes blue. Hair brown. Eyes both 6/6. Hearing good. Colour vision normal. Limbs and chest well formed. Heart and lungs normal. Free from hernia, Varicocele, varicose veins, haemorrhoids, inveterate or contagious skin disease. Vaccinated. Good bodily and mental health. No slight defects. Wounded in the landing at Anzac Cove; recovered sufficiently to return to the firing line. Wounded 28 April 1915 at Dardanelles; admitted to Hospital at alexandria, 30 April 1915; now fit for duty, sent to the front from the base at Alexandria - May/June 1915. Wounded a second time - more severely, & invalided to England where he died. 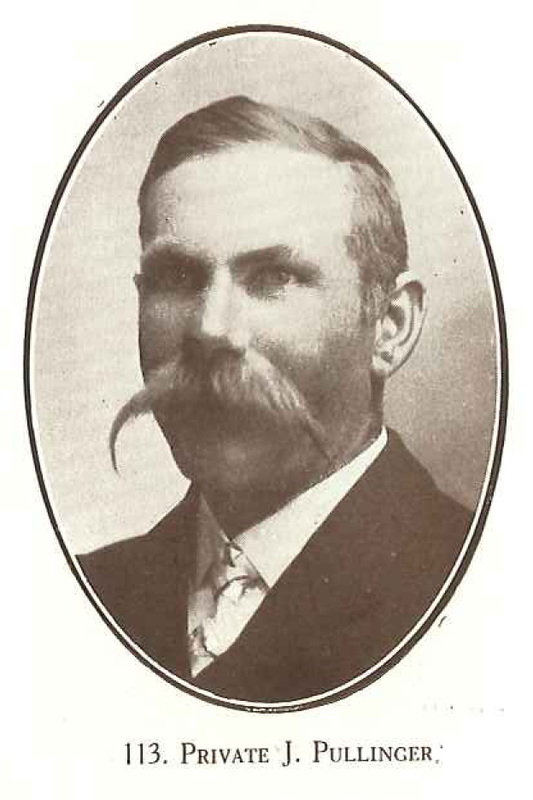 James PULLENGER was born in 1878 in Tinwald, a son of Robert and Charlotte PULLENGER, of Tinwald, New Zealand. The family later moved to Maheno, where his mother died in 1896. James attended Maheno School, where he received honours mention in Standard IV in 1889. After leaving school he worked as a labourer at Maheno, then at St Andrews where he was residing when he enlisted. James served throughout the South African campaign, then enlisted in Timaru at the outbreak of WWI. His brother, George William PULLINGER, also served in WWI and was at the Dardanelles when James died. James was wounded in the landing at Anzac Cove but recovered sufficiently to return to the firing line. His second wound was more serious, necessitating his being invalided to England where he died of disease (enteric) in the Devonport Hospital. James's plaque and scroll were forwarded to his brother Robert PULLENGER at Huntervill, as his father haddied in 1917, and his next-of-kin, his sister Eliza Annie OTT, died in 1918. A nephew of James, Charles George OTT, died of wounds in 1918 in France. His medals were sent to Mrs J. G. Anderson at Kaukapakapa, Auckland, in 1923. James's estate was administered by the Public Trust office in Wellington, on the authority of the beneficiaries. James had drawn uo a short soldier's will in his paybook, dated 25 May 1915. He left 100 pounds to his sister, Mrs C. J. OTT; and he left to Miss Lizzie OTT and his brother Stephen the remainder to be equally divided between the two. James was a quiet, unassuming man, popular with all with whom he came in contact, "a fine stamp of New Zealand manhood". .
Cenotaph Database [03 December 2013]; NZ Defence Force Personnel Records (Archives NZ ref. AABK 18805 W5550 0095057) [03 April 2014]; CWGC [03 December 2013]; Otago Witness, 19 March 1902, North Otago Times, 3 June 1915, Timaru Herald, 21 & 22 September 1915, 27 September 1915 (Papers Past) [06 December 2013, 03 December 2013; 07 & 13 August 2014].